Always happy to embrace life with a smile and a laugh, Rebekka Johnson brings an infectious joy to her performance in the Netflix dreamed GLOW. In a show that is all about women claiming their own power and taking pride in their accomplishments and physicality, GLOW is full of exuberance and tenacity. It is an empowering feeling for both viewers as well as those working on the show. In an exclusive interview, Rebekka talks about how portraying her character Dawn has given her more confidence in her own life and renewed her passion for her craft and working in comedy. 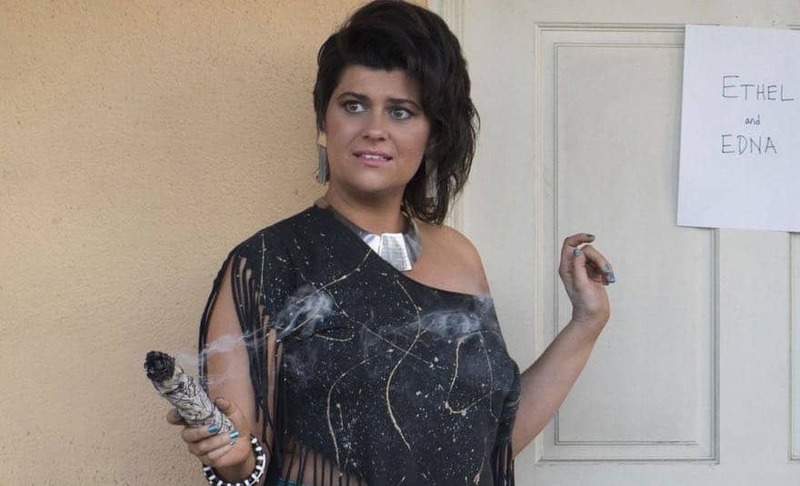 What was the initial appeal for you about portraying Dawn and working on Netflix’s GLOW? REBEKKA: I was so pumped to get an audition for a Jenji Kohan show, but the fact that it was based on the original G.L.O.W., was even more exciting. I used to watch it as a kid and I loved it. The themes! The comedy! The wrestling! There couldn’t be another show that is more up my alley. How would you describe who Dawn is in the series? REBEKKA: Dawn and her best friend Stacey (Kimmy Gatewood) are described as the rodeo clowns of the show. They are generally down to do anything for a laugh, but Dawn is slightly more cautious and sometimes needs an extra push from Stacey. REBEKKA: Dawn has very high self-esteem and is 100% body positive. She is a go getter and isn’t deterred by struggle, whether it comes to nailing a move or getting a date. I think Dawn’s confidence has rubbed off on me. I’m wearing a leopard print unitard right now! 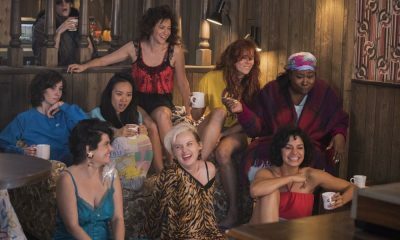 What is it like working alongside the talented ensemble on GLOW? 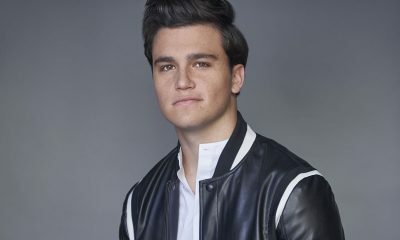 REBEKKA: Honestly, I’ve never peed myself more from laughing. Too much information? Too bad! We are genuinely friends, who have each other’s back and even after spending 14 hours a day together, we still hang out on the weekends and between seasons. Portraying Dawn as Edna Rosenblatt, you get to work with Kimmy Gatewood. What is that experience like? How would you describe the dynamic between your characters Stacey and Dawn? REBEKKA: Kimmy and I have been comedy collaborators and best friends for over 10 years. Before GLOW, we often auditioned for the same parts but getting cast together and playing best friends is pretty much a dream come true! When we are the Beatdown Biddies, we get to improvise and work out bits and sometimes it feels like we share a brain. Stacey and Dawn are inseparable. They have a similar dynamic to Kimmy and I. Not only do they share a brain, but they share accessories, clothes and their signature side-mullet hairdo. Then what is the best part about working with Alison Brie and Betty Gilpin, who portray fellow GLOW members in the ring? REBEKKA: They are both so good at what they do. I told Alison that watching her work is like getting a master class on acting. Betty is so funny, her dark wit kills me. REBEKKA: One of my favorites was Episode 3 of Season 1, when we shot the promo for the Beatdown Biddies. They wrote a few lines for us, but said we could do whatever we wanted. Kimmy and I took 45 mins, wrote a bunch of jokes and shot several versions. I felt like it was a culmination of my 20 years in comedy, not only getting to act on a TV show, but saying my own jokes in a ridiculous costume. When I finally got to see that part of the episode, I cried. My husband thought I was crazy but I couldn’t believe it. They kept our bits! Episode 7 of Season 1 was also a highlight. Before going out as the KKK, Stacey and Dawn check in with each other, worried about coming off as racist. It was the first time you get to see that Dawn and Stacey are more than just wild idiots. REBEKKA: I was a new mom before Season 1 and I was really out of shape. Wrestling was hard on my jiggly mom bod. I got tendonitis in my knees, sprained the ball of my foot and threw my neck out. It was rough. I decided to get in shape after Season 1. I just wanted core strength to support my old knees. I took pilates and ate less like a 17 year old boy. In Season 2, I was able to handle so much more, wrestling-wise. Has GLOW left an impression on you in your life? If so, in what way? 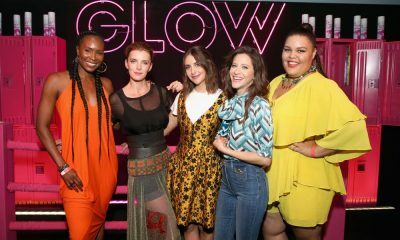 REBEKKA: GLOW is inspiring in so many ways — not only as a job, but also the content of the show. I am more confident as an actor, comedian and just generally a woman. I was beginning to think that I may never get the chance to be a part of something at this level. My journey is similar to my character’s — this show was worth the wait. 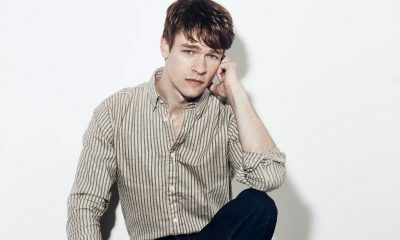 Then as an actor, what has been the one thing you have taken away from the experience of working on GLOW? REBEKKA: Dawn had 2 written lines in the first few episodes. I learned how to make her into a real person by adding my own subtext even when I am just in the background. As an improvisor, I was used to working on the fly and making choices on the go. Watching the stars of the show work has made me realize how much more I need to prepare before the shoot. It has made me a better actor for sure. What is your proudest achievement working on GLOW? REBEKKA: Doing a “sunset flip.” It’s like a summersault over another person and then taking them down to the mat. Also getting a SAG award nomination. That was pretty dreamy. What have you learned about the female wrestling profession as a result from working on the show? REBEKKA: Female wrestlers have been undervalued for so long. Sometimes they are treated more like athletic models than the badasses that they are. My favorite wrestlers are Taya Valkarie, Natalya, Kiari Sane… I hope to see a better male/female ratio in the televised wrestling programs. The Gorgeous Ladies of Wrestling was revolutionary. I’m so happy to celebrate their groundbreaking show. REBEKKA: My career has had many ups and downs. 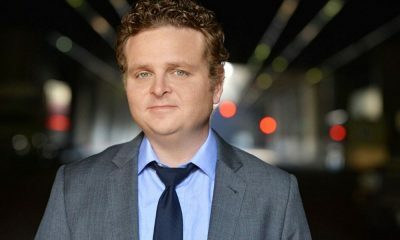 I started doing improv in college and got on a UCB team when I was 21. By 23, I was on an MTV prank show. I thought I would continue to get bigger and better jobs but even when I got close, I couldn’t breakthrough. I performed with my musical comedy group, The Apple Sisters — we built a following and got to perform for Judd Apatow and casting director, Jen Euston. Still, I wasn’t working in comedy full time. After moving to LA, I decided to expand my options and took jobs producing, writing and directing while still waiting tables. In fact, I waited on Alison a few times! For 4 years, I produced and directed the interview show, Speakeasy With Paul F Tompkins. I had to book guests, pre-interview them and direct the episodes. Alison and Marc Maron were 2 of the 100 guests we had on. I was hired to do a line or two in a couple Judd Apatow movies. Eventually, Jen Euston reached out to Kimmy and me to audition for GLOW because she remembered The Apple Sisters from 10 years before. You never know what connections you make will help you later, when the right thing comes up. It’s funny to be on the other side now, in some ways. I still operate like I did before GLOW, I have several scripts I am developing, hustle for directing jobs and teach improv. I guess I am surprised that I’m still doing it — even though I can’t imagine doing anything else. REBEKKA: I have learned that the most important thing is to be friendly, game and confident. Roll with the punches but know when to stand up for yourself. You are your biggest advocate. REBEKKA: I’ve met cool people like Method Man and Gloria Allred! I get to have a slightly bigger platform to talk about issues I care about. Career wise — I am able to get into bigger rooms to pitch ideas to people who can actually make them. More doors are open for sure. REBEKKA: Fans should seek out female and gender non-binary led projects, tweet about them, talk about them, lend the power of your voice to them. I watch shows like THE HANDMAID’S TALE, INSECURE, THE BREAK WITH MICHELLE WOLF, FLEABAG, CRAZY EX GIRLFRIEND, JESSICA JONES, FULL FRONTAL WITH SAMANTHA BEE, to name a few. Dark times call for musical comedy, I suppose! To see what hilarious comedy awaits Dawn and Stacey in and out of the ring, Season 2 of GLOW will be available for binge-watching on Friday, June 29th on Netflix. 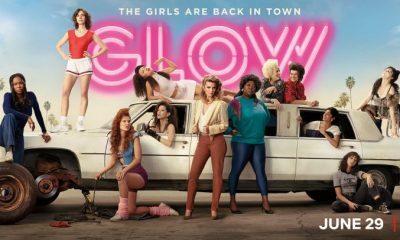 More information about the show can also be found by following the show on Twitter @GLOWNetflix. Then to see what great adventures are ahead for Rebekka as her career continues to grow, you can also follow her on Twitter @hellorebekka.